Like hiking a serious mountain, we’ve now breached the alpine zone and have the peak in sight. And much like how the air thins out at this point in the climb, so does the quantity of Orcs we have to suffer. Archimonde awaits just over the crest, but first we must throw down his vanguard in Destructor’s Rise: Zakuun, the torturer of Grommash Hellscream; Xhul’horac, a malevolent being from the void; and the reanimated vengeance of Mannoroth, who is essentially the Washington Generals of the Burning Legion. One of the primary goals of the raid during this fight is to control both the number of Fel Crystals that spawn and where those eventual Fel Crystals end up spawning. The most important role you have in this process as a tank is to ensure that you aren’t allowing Fel Crystals to spawn near where the boss is being tanked, as that’ll make unnecessary damage from Unleashed Energy skyrocket. To briefly overview the life cycle of a Fel Crystal: They spawn from Rumbling Fissures, and one of those fissures must spawn a Fel Crystal. You can control which spawns that mandatory crystal by having the raid soak fissures to remove all but the best positioned one. The off tank should always soak the fissure closest to Zakuun, because it is especially important to prevent a crystal from popping up next to the boss. Zakuun will shoot out Wakes of Destruction occasionally, and if any hit a crystal, it will send out a serious amount of raid damage via that Unleashed Energy burst. Thus, crystals should be as far away from the boss as possible. If one appears next to the boss, you need to move Zakuun. 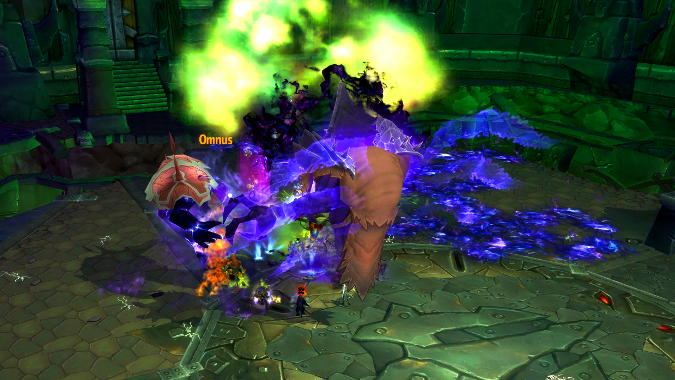 If the raid is handling fissures, and the off tank is soaking one, this shouldn’t be an issue. When it comes to actually tanking Zakuun, there are three phases that he’ll move through. He’ll alternate the first and second until 30% health, when he switches to phase three. Phase one is the Armed phase, when Zakuun will wield his axe and threaten the tanks with Soul Cleave. If you’re the active tank, you want to use a cooldown (like unglyphed Divine Protection) for Soul Cleave. When hit by Soul Cleave you will be transported to the Shadow Realm, which is a purple-y carbon copy of the boss area. While there, you’ll have waves and rings erupting from spheres of Residual Energy all around you and you need to dodge your way around them. Specifically, move around gaps in waves and hop over rings. Finally, when your time is up, you’ll be transported out of the Shadow Realm, and leave behind a new Residual Energy orb where you exited. Make sure you drop it out of the way so you’re not making things more difficult for subsequent visits to the Shadow Realm. After a set amount of time, Zakuun will switch to his second phase, Disarmed. When disarmed, the two tanks need to stack on one another to split the damage from the boss’ Heavy Handed buff. Waves will be erupting around the room during this phase, so it’s important that the two tanks coordinate their movement to stay stacked. On the bright side, there’s no Soul Cleave in this phase. However, the physical damage from the boss’ assaults is pretty heavy, as he attacks with both hands and gains 30% haste. Cooldown usage is mandatory to counter the increased damage, and talenting into Holy Avenger will guarantee you 100% Shield of the Righteous up-time for 2/3rds of the phase. After 30 seconds, Zakuun will switch back to being Armed. Both phases repeat and then, at either the point where the boss hits 30% health or the Disarmed phase happens for the second time, the boss will enter his third phase, Enrage. At this point the damage ramps up and you’ll need to empty out your cooldown toolbox to come out safely on the other side. Use Holy Avenger when available, as well as Guardian of Ancient Kings, to mitigate the damage coming from the boss’ attacks — he’ll be benefiting from Heavy Handed for the rest of the fight. Again, bright side: no Soul Cleave at this point (that would be unfair). Keep yourself alive and ensure the boss is in a good spot, and you should knock him over in no time. This fight is ostensibly a four phase fight, but when it comes to tanking, the mechanics aren’t particularly complicated until you get to the second half of the encounter. The first two phases involve focusing on burning down mini-bosses that come to Xhul’horac’s aid, and the next two phases are an extended burn while passing the boss back and forth flawlessly to avoid “crossing the streams” of the debuffs it’ll be throwing on the tanks. In phase one, the boss will spawn a fire miniboss and waves of imps. One tank should tank the boss and one the miniboss, no need to tank swap. You can use glyphed Holy Wrath to stun all three imps at once and prevent them from casting Fel Orb. Avenger’s Shield is also good for a ranged interrupt, but it will only interrupt the cast of the first target of your shield toss (the bounces interrupt nothing). And, of course, make excellent use of Rebuke. The imps aren’t as dangerous in phase one, but once you get to the subsequent phases, combining their fire attacks with the shadow attacks can lead to Shadowfel Annihilation damage hitting the raid and that’s very bad. It’s important that the tanks assist in ensuring that zero Fel Orb casts go out. When the first miniboss is dead, Xhul’horac should be moved to the shadow portal’s half of the room where the shadow-flavored adds will begin to spawn. Imps will continue to spawn as well, so don’t let up in your vigil against them. The shadow miniboss will spawn as well, and must be tanked by the inactive tank. Keep everything under control and when the miniboss is dead once more, the third phase will begin. Move to a clean area of the room (you do not want to chance stepping in the wrong puddle of bad) and psyche yourself up for some tank swaps. The key to the last two phases is to juggle the boss in a way that one tank is always eating Fel Strike and the other is always eating Void Strike. If a tank gets the debuffs from both attacks, they will explode in a Shadowfel Annihilation and that’s very bad. In phase four, with all the raid damage going out, an unexpected and poorly timed one will likely cause a wipe. Calling out on voice chat that you are grabbing aggro might help build a tempo with you and your co-tank, so that it’s difficult for either of you to forget who should be tanking at that moment. Likewise, if you are eating Fel Strike and the boss is glowing green and you are not tanking at that moment, you need to immediately grab aggro (and vice versa). Imps will continue spawning in this phase. If you are comfortable assisting in targeted interrupts, try to help the melee out in keeping Fel Orb casts locked down. At the very least, continue using Holy Wrath as best you can. At 20% health, the boss will enter its last phase. No more imps will spawn, but now it’s a race against the clock. Every 10 seconds the boss will unleash Overwhelming Chaos against the raid. The damage of that burst stacks each time it goes out, so things can get ugly fast. Use cooldowns when one is about to go out, and burn down the boss before it overwhelms the raid. While this is a long fight, the tanking portion of it isn’t particularly intense. Most of the fight mechanics will be for the DPS and healers to contend with. 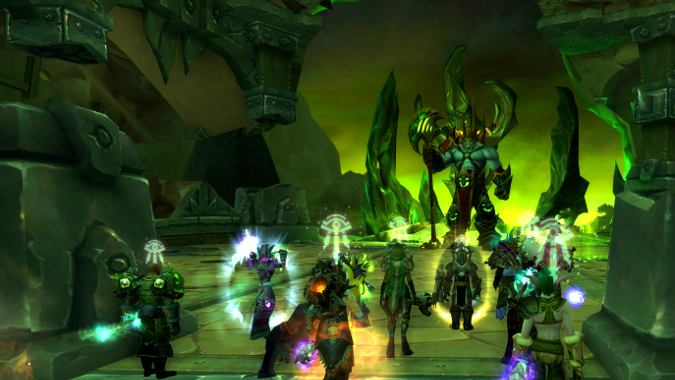 The fight starts with Mannoroth still dead. You’ll have to manage waves of adds that are being summoned by Fel Iron Summoners. Only the Doom Lords actually need to be tanked, everything else will be dealt with by DPS. The Doom Lords apply a debuff to their tank called Doom Spike. This debuff application does no damage, but instead deals damage proportional to how many stacks you have when your debuff expires. So the key is not to accumulate too many stacks (shoot for about 7-8) and to pop a cooldown (Divine Protection) to take the edge off of the expiration. In addition, help with interrupts on Shadow Volley Bolt. When the last summoner is dead, Mannoroth is resurrected and the real fun begins. Take Mannoroth to the green pillar and keep your back to it while tanking. At this point the tank’s attention should be focused on properly coordinating handling the Glaive Combo. First Mannorth will use Glaive Thrust, and then follow up with Massive Blast. You must use Shield of the Righteous for Glaive Thrust, otherwise you will take a Puncture Wound debuff. Then make sure to use Divine Protection for Massive Blast, to cut down on the damage you’ll be taking. That attack will also fling you back – though if you are properly positioned you’ll be caught by the green pillar. Once the active tank is flung backwards, the other tank must immediately pick up Mannoroth and contend with a Glaive Combo of their own. If a tank takes two Massive Blasts in a row it won’t be pretty. Phase three continues similarly for tanks — you’ll still need to deal with Glaive Combos. 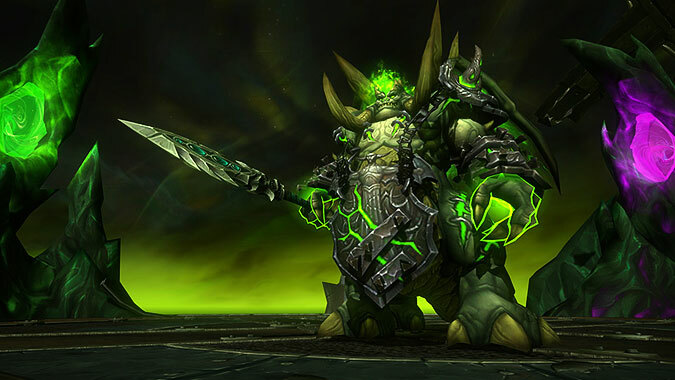 Once Mannoroth is down to 35% health he will enter his last phase, and all his abilities will be empowered. The green pillar will also be destroyed, so it cannot be used as a safety net for Massive Blast anymore. 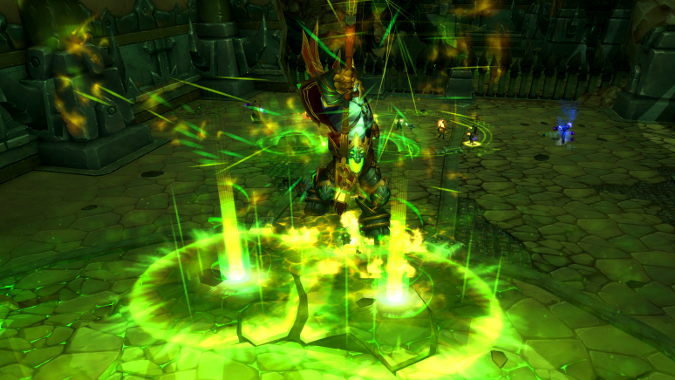 Instead spin Mannoroth around 180 degrees and use the vast expanse of the fight area for Massive Blast. You don’t want anyone in front of the boss at this point, even the inactive tank, because Glaive Combo is extra dangerous. Empowered Glaive Thrust now has a cleave effect, and Empowered Massive Blast unleashes some shadow waves that chase the punted tank. That tank needs to then navigate through gaps that form between the waves on their way back to the boss. Meanwhile, the off-tank needs to hang out in Mannoroth’s hindquarters when not actively tanking, and immediately run up and grab aggro after the punt occurs. Lastly, you’ll have to deal with Empowered Shadowforce’s push-back during the last phase. Thankfully he will not use Glaive Combo during the push-back, so don’t worry about people crossing in front of Mannoroth while strafing as if their lives depended on it. And that’s pretty much it for the tanking angle on this fight! It’s a long one, good luck on the encounter and hopefully everyone can hold it together right up until the very end.